Two years have passed since I first conceptualized the Treeosaur theory. I have learned a great deal about T. rex during this time from books and the web. There is much more to this mysterious dinosaur than I had originally thought. The amazing news is that I may have ascertained additional T. rex information that supports the Treeosaur theory. During my research of T. rex, I discovered that there are many theories on T. rex and that there are some gaps in its history and evolution. This should come as no surprise once we realize that paleontologists are working with very little physical information on T. rex. Paleontologists only have fossilized T. rex bones, T. rex bite marks in fossilized prey bones, and T. rex coprolites (fossilized dinosaur droppings) to work from. It is a daunting task, but paleontologists are constantly striving to uncover more about T. rex to fill in the gaps. There has been much debate over T. rex ever since it was first discovered over a hundred years ago. Most paleontologists believe T. rex was an active hunter, but some paleontologists believe T. rex was a scavenger. Some paleontologists believe T. rex was a fast runner, while other paleontologists believe T. rex was a slow walker. Apparently, there are many of these T. rex mysteries. As paleontologists unearth more T. rex fossils, new information will help them unravel some of these mysteries. I believe the Treeosaur theory could be a new T. rex theory. After two years of researching T. rex, I have not found any information to suggest that paleontologists ever applied the stand hunting from a tree strategy to T. rex. At first I was surprised by this, but now I understand why. Stand hunting from a tree is only one single hunting strategy out of hundreds of modern human hunting strategies. To my knowledge, this unique hunting strategy does not exist in the modern animal world. Paleontologists speculate dinosaur behavior by studying modern animals and making comparisons. This is a common practice and is considered good science. I believe paleontologists never applied the stand hunting from a tree strategy to T. rex by no fault of their own. They never looked at this particular hunting strategy because it simply does not exist among modern animals, which is the usual area for dinosaur comparison. Some people imagine that a human hunter will simply walk up to a wild animal and use their hunting weapon to dispatch it. Hunting is anything but simple; it is a challenging and complicated process. Wild animals do not want to be approached by humans and they will do everything they can to avoid us. Basic instinct warns these animals to not trust us: not even the Vegans among us! Our bipedal body posture and forward facing eyes are dead giveaways that we are evolved predators. Wild animals are not easily fooled, which is the reason why there are hundreds of human hunting strategies designed to outsmart them. 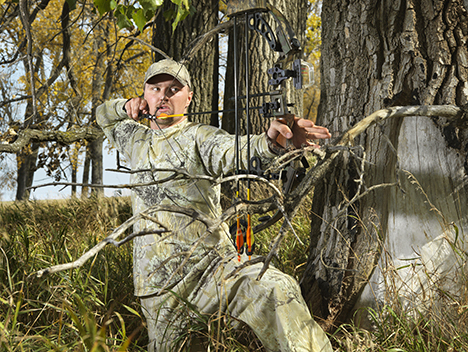 Stand hunting from a tree is only one hunting strategy and is only productive in environments containing trees. This just so happens to be the same type of environment where T. rex lived and thrived. As I began my research two years ago, I wanted to keep an open mind. My primary goal was to gather any T. rex information that would help support the Treeosaur theory. But I also realized I could not be biased; I needed to scrutinize any T. rex information that may go against or contradict the Treeosaur theory. Almost immediately after I started researching T. rex, I came across some information that practically derailed the Treeosaur theory. I found out that some paleontologists do not believe T. rex could have stood or moved in a vertical posture as previously thought. They believe this posture would have put too much strain on T. rex’s back. They also believe this posture would have bent the tail to its breaking point. In the Treeosaur theory, T. rex would not have stood in a vertical posture; however, it would have sat in a vertical posture. This new information posed a problem for me. I decided to put everything on hold until I figured out a solution to this setback. I looked over many photos of T. rex on the web and in books. I also studied the photos I had taken of Sue in Chicago. Sue was displayed in a horizontal posture, which paleontologists now believe is the correct standing and moving posture for T. rex. The vertical T. rex posture was an older belief that is now considered incorrect. I was aware of both the old vertical and new horizontal T. rex postures before I started working on the Treeosaur theory. I assumed that the old vertical T. rex posture was possible for T. rex to achieve, even if it were just a rarely used stance. If paleontologists believed that the vertical posture was never even possible for T. rex, this exposed a flaw in my theory. Comparison of T. rex in the old vertical posture and the new horizontal posture. I purchased a high quality 42” plastic replica of T. rex’s skeleton. I wanted to see if I could rearrange the model into the sitting vertical Treeosaur posture. I slowly and meticulously pieced together the T. rex skeleton. I used mostly rubber bands and small amounts of glue so I could flex the T. rex skeleton into slightly different postures. Once the model was fully assembled, I glued a piece of PVC tubing (4 ½” x 32”) to the corner of a rectangular piece of thick plexiglass. The PVC tube would represent the trunk of a tree. After trying to forcefully fit the T. rex skeleton against the PVC tube into the vertical sitting Treeosaur posture, I realized that the paleontologists might be correct. The plastic spine’s dorsal vertebrae separated in a few places. This would have meant a broken back for T. rex. However, the tail seemed to be holding together because it gradually curved down to the ground. I slid the T. rex skeleton slightly away from the PVC tube. To my relief, the dorsal vertebrae snapped back into place. I realized my initial mistake: I positioned T. rex too close to the tree in my original Treeosaur drawings. By backing the model slightly away from the PVC tube, T. rex’s spine had a more gradual curve all the way down the length of its body. I am not an expert on T. rex biomechanics, but this tweaked T. rex Treeosaur posture seemed like it may have been possible for T. rex to achieve. T. rex’s natural Treeosaur posture seemed to be a combination of the old and new postures: vertical front half of body and horizontal back half of body. The Treeosaur theory was now back on track! Upper two photos: The arrows show breaks in T. rex’s spine during my initial attempt to determine the Treeosaur posture. 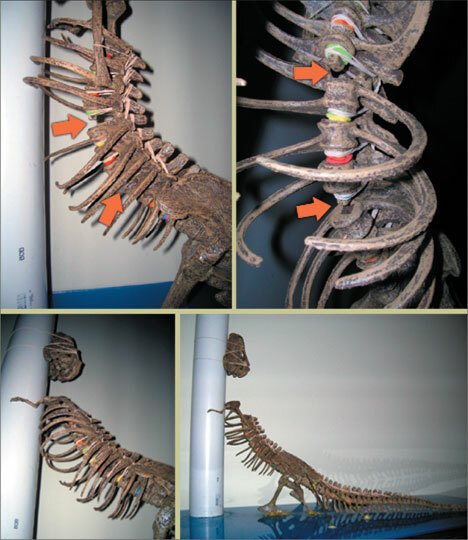 Bottom two photos: T. rex’s spine remained intact during the corrected Treeosaur posture. T. rex stand hunted from a tree. I resumed my research on T. rex. The next topic I looked into was T. rex’s eyesight. Some paleontologists believe that most of T. rex’s field of view would have been peripheral vision. I was pleasantly surprised to learn that some paleontologists believe that T. rex also had a small slice of front binocular vision. Human vision is reversed; we have mostly binocular vision and less peripheral vision. Binocular vision is very important to a predator because it gives it depth perception, allowing the predator to gauge distances to its prey. Comparison of a human’s and a T. rex’s field of view. Having both peripheral vision and binocular vision would have been a great advantage for T. rex stand hunting from a tree. Remember, T. rex’s head was pointed up, facing the sky in the Treeosaur posture. T. rex needed to rely on its wide peripheral vision to initially see its prey and then binocular vision to attack the prey. T. rex’s peripheral vision, while in the Treeosaur posture, would probably have been able to see over 50% of its total surroundings with its head in a stationary position. T. rex’s eyes were placed high on its skull. 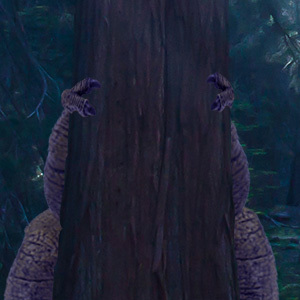 In the Treeosaur posture, the eyes would have been positioned 2 – 3 feet away from the tree. If T. rex simply rolled its head left or right, it would have been able to see farther around the tree with one eye and farther behind its body with the other eye. It may have been possible for T. rex to scan over 80% of its total surroundings in the Treeosaur posture. The only areas out of T. rex’s visual reach would have been a very small slice in front of the tree and a very small slice behind its body. Not too bad! T. rex slowly rolling its head would have changed its silhouette very little. Nearby prey animals probably would not have been able to detect this subtle movement. Aerial view of T. rex’s peripheral field of view while in the Treeosaur posture. T. rex’s binocular vision would have come into play once T. rex dropped its head to either side of the tree for an attack. I personally believe T. rex was a short-range attacker. I envision T. rex simultaneously dropping its head, leaning into the tree at its chest, standing up, folding its arms back, and propelling forward off the side of the tree in the direction of its prey. I imagine that this rocket launch occurred extremely fast as T. rex exploded off the tree. Binocular vision would have been very important in allowing T. rex to visually lock onto its prey once it separated from the tree and committed to an attack. T. rex relying on its binocular vision after it launched off the tree in an attack toward prey. Paleontologists believe that T. rex had good hearing. T. rex’s ears were located on the back sides of its head, centered in between its lower jaw and top of its head. T. rex’s ears would have automatically pointed in the same direction as its eyes when it rolled its head while in the Treeosaur posture. T. rex would have been able to scan most of its surroundings in the Treeosaur posture with its vision and hearing without compromising its position to nearby prey. When I stand hunt from a tree in a forest, I often hear incoming deer before I see them. Once I hear movement, I scan that general direction with my eyes and wait for deer to visually appear. I believe T. rex also detected prey initially with its ears and then with its eyes. Some Paleontologists believe T. rex had a very acute sense of smell. If this were true, it’s acute sense of smell would not have been all that important for T. rex while stand hunting from a tree in the Treeosaur posture. However, T. rex’s sense of smell would have been extremely important in helping T. rex choose a good location from which to stand hunt from a tree. Pre-scouting is very important to a human hunter. Before deer hunting season, I pre-scout the forest where I plan to hunt. My goal is to learn as much information as possible about that particular forest. I look for any visual deer sign to indicate if deer are heavily using specific areas of the forest. Certain things I look for are deer trails, tracks, droppings, etc. If I don’t discover any promising deer sign in one area, then I’ll move to another section. Once I do find a lot of deer sign concentrated in one area, I’ll formulate a hunting plan for that specific area. Many variables come into play: terrain features, tree positions, anticipated wind direction, etc. These variables allow me to figure out the best tree to set up my stand to ambush deer from. Pre-scouting provides me with valuable information which boosts my odds for success. T. rex did not have the intelligence to visually pre-scout and interpret a forest like humans do. However, T. rex did have something that we humans don’t: an acute sense of smell. All T. rex would have had to do was walk slowly through a forest until its nose picked up concentrated odors of recent prey activity. T. rex would have instinctively known to hug a nearby tree, blend into its surroundings and wait for prey to return. Its acute sense of smell would have been of little use once T. rex was set up in the Treeosaur posture. Wind usually blows from one single direction, thus making it more difficult for a predator in a stationary position to smell incoming prey. Once settled into the Treeosaur posture, T. rex would have depended on its ears and eyes to detect prey. The worst thing a hunter can do is stand hunt from a tree in one location for too long. I never hunt one location for more than two days in a row. The more time a hunter spends in one location, the better the chance that local animals will detect his presence. After a day or two, most of the local animals have smelled, heard, or even seen the hunter. They will simply avoid that area until the hunter leaves. We hunters call this “burning out a stand.” If the hunter doesn’t move to a fresh area, he will have a very uneventful and disappointing hunting trip. I believe T. rex instinctively would have moved position as well to outsmart its prey. One thing which troubled me early on with the Treeosaur theory was the position of T. rex’s head. I believe that T. rex with its head in the straight up position is correct, but T. rex’s head was very heavy. I questioned whether or not T. rex could have held its massive head up in that position for an extended period of time. In the Treeosaur posture, most of T. rex’s upper body would have been supported at its chest and arms where its body contacted and leaned into the tree. T. rex’s neck was strong; but was it strong enough to independently support the load of T. rex’s massive head in the Treeosaur posture? I really racked my brain over this question until something finally came to me during my research. I learned that some paleontologists believe most theropods, including T. rex, had expanding jaws similar to those of snakes. It is thought that when T. rex opened its mouth, its jaws flexed outward. In the Treeosaur posture, the underside of T. rex’s lower jaw contacts the tree. I believe that T. rex would have used this jaw flexion to grip its lower jaw against the tree like a vise. While T. rex hugged a tree in the Treeosaur posture, it would have opened up its mouth and expanded its lower jaw outward. Then T. rex would have closed its mouth and squeezed its lower jaw inward against the tree. This act would have provided extra support for T. rex’s head. Between T. rex’s strong neck and viselike lower jaw, keeping its head up for extended periods of time may have been possible. The arrows indicate T. rex’s jaw flexion, which possibly helped support its massive head by gripping its lower jaw to a tree. A great benefit a hunter has while stand hunting from a tree is the option to move around the tree into a more favorable hunting position. Obviously, a hunter cannot always predict which direction prey will approach his stand. More often than not, I will hear or see deer approaching my stand from an unexpected direction. If so, I will slowly and stealthily crawl around to the opposite side of the tree into better hiding and firing position. In this situation, I’ll use the tree to my advantage by keeping the tree in between myself and the approaching deer. This act will maximize the concealment of my body’s silhouette from the deer’s sharp eyesight. I’ll then wait for the deer to pass by my tree at close range and take my shot. This tactic is especially useful when I hunt with short-range archery equipment (bow or crossbow). If T. rex had used the stand hunting from a tree strategy, it also may have moved around the tree to conceal its position from approaching prey. A hunter moving around a tree into a more favorable hunting position. Prey could have approached T. rex’s stand from any direction. T. rex’s position would have been jeopardized if prey approached T. rex’s stand from a side angle. At such an angle, T. rex’s full body silhouette would have been exposed. T. rex may have countered this the same way as some human hunters: by stealthily moving around the tree into a better hiding and attacking position. T. rex’s silhouette would then have been minimized behind the tree. T. rex would have made this move around the tree as soon as its senses detected prey approaching from a certain direction. If T. rex had delayed in moving, it would have run the risk of being heard or seen by approaching prey. T. rex moving around the tree into a better hiding and attacking position. I am not an expert on T. rex’s biomechanics, but I believe T. rex may have been able to stealthily move around a tree while remaining in the Treeosaur posture. I imagine T. rex slowly and quietly doing an incremental sideways creep around the tree to conceal itself from approaching prey. T. rex had a large, boot-shaped pubis, which I believe was the main support structure for this sideways body movement. If T. rex’s pubis was small or absent, it would have been impossible for T. rex to maintain the upright Treeosaur body posture as it moved around the tree. T. rex’s large boot pubis, powerful legs, stabilizing arms, strong neck, and viselike jaw could support the rest of its body during this sideways maneuver around the tree. I am not certain about the sequential order in which T. rex’s body parts were used during this movement, but I do think the Treeosaur sideways maneuver around a tree was possible. T. rex performing an incremental sideways creep around the tree. T. rex maneuvering around the tree would not only have given it a better hiding place, but it would also have positioned T. rex’s big gun (its jaws) and body directly toward approaching prey. I believe T. rex’s optimal firing (attack) zone would have been at the front sides of its Treeosaur position. Approaching prey would have been extremely vulnerable in this area. By instinct, prey would have tried to turn around to flee in the opposite direction when T. rex attacked. Prey making a 180° turn in this zone would have given the attacking T. rex a major advantage. T. rex’s optimal attack zone – the front sides of its Treeosaur position. Prey animals cannot see too far ahead in a forest because of the dense trees and vegetation. Forest prey prefer to walk slowly and use their keen senses to scan ahead for danger. When spooked in a forest, most prey will make a 180° turn to flee to safety. When prey in a forest are forced take evasive action to escape any perceived danger, they do not have time to use their senses to scan safe alternate escape routes in a thick forest. Prey will instinctively run away in the only direction they know is safe: the direction from which they just came. Also, if the prey animal is part of a herd, it will attempt to move back into the safety of its herd, which is probably following behind. Ninety percent of the time, a white-tailed deer will make an about-face when spooked by a hunter stand hunting from a tree. I imagine that T. rex’s prey probably made the exact same defensive maneuver when ambushed in a forest from a T. rex stand hunting from a tree. Prey would have been at a major disadvantage if they had made any drastic turns in T. rex’s attack zone. This act would have shaved off valuable seconds from its escape time. An attacking T. rex only had to keep its body momentum moving in one general direction: toward the prey. This advantage would have allowed T. rex to rapidly reach its full running speed in a short distance. A prey animal trying to reach its full running speed would have taken longer if it stopped to turn around before fleeing. This small delay would have allowed T. rex to reach its full running speed before the prey animal could reach its full running speed. In this type of scenario, the attacking T. rex probably would have been able to overtake the prey animal in a short distance. 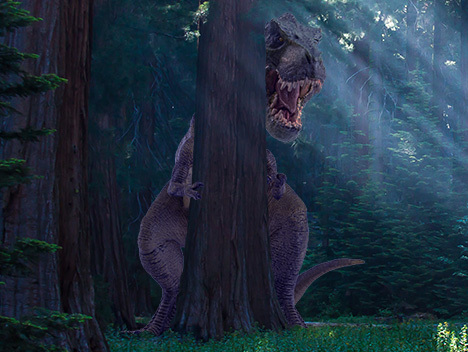 Example of T. rex’s line of attack on prey in a forest. T. rex attempting to ambush prey outside its attack zone would have been a futile effort because T. rex would have had to turn its body at the onset of the attack. This act would have delayed T. rex in reaching its full running speed. Also, prey would have been able to detect T. rex’s silhouette from an angle and instantly flee. This combination of a slower attacking/more exposed T. rex would have given prey more lead time to escape. In this scenario, prey would have a greater chance of reaching its full running speed before T. rex could reach its full running speed. This translates to a lower success rate for the T. rex. Another area that is very productive to hunt is along the edge of a forest. Deer hunters call this “edge habitat.” Deer are very adaptable animals and are just as comfortable living in open areas around forests as they are inside forests. Deer use the edges of forests as their main travel corridors (highways) when they move about their home ranges. Edge habit is much easier for a deer to move through than the inside of a thick forest. If spooked, deer only have to run a short distance into the forest to disappear from edge habitat predators. This combination of easy travel and nearby secure cover for deer makes edge habit a very favorable area for hunters to ambush deer. Most deer hunters will set up their stand just inside the forest, not far from the edge. T. rex had a few different types of potential prey: Ceratopsids, Hadrosaurs, Ankylosaurids, etc. I learned that some of T. rex’s prey are thought to have lived in open environments and others are thought to have lived in forest environments. Some of T. rex’s prey may have been just as adaptable as modern white-tailed deer and lived in both open environments and forest environments. I believe that all of these animals probably would have used forest edge habitat to efficiently move through an area, just like modern deer. This would have been advantageous for T. rex because it would have placed an abundance of potential prey in predictable areas of an environment. T. rex’s acute sense of smell would have revealed these active edge habitats. All T. rex would have needed to do was hug a tree next to one of these dinosaur highways and wait to ambush prey. Even that 1993 dinosaur blockbuster movie portrayed edge habitat hunting. In the same brilliant scene I mentioned previously, a T. rex ambushes a herd of omnivore dinosaurs as they ran past the edge of a forest. The scene doesn’t show us what the T. rex was doing prior to bursting out of the tree line, but I believe this is a striking visual example of how T. rex may have used edge habitat to ambush prey. I believe T. rex hunted edge habitat almost the same way it hunted inside a forest. T. rex would have hugged a tree just inside the forest edge and pointed its body toward the open area. This position would have set up T. rex’s attack zone directly across from the dinosaur highway. The only difference between T. rex hunting edge habitat versus deeper inside a forest would have been its movement around a tree. Forests tend to have very thick, low vegetation around their edges because more sunlight reaches the forest floor. This extra thick, low vegetation would have made the Treeosaur sideways maneuver around a tree more restrictive for T. rex. On the plus side, the thick cover would have helped conceal T. rex’s side silhouette very well. Another advantage for T. rex was that prey moving through edge habitat would have had a very predictable travel route. For this reason, T. rex hunting edge habitat would not have had to adjust its attack zone very much. T. rex only had to keep its body pointed toward the dinosaur highway, just beyond the forest’s edge. T. rex would have been able to make subtle Treeosaur sideways maneuvering to the left or right if it sensed prey approaching from a certain edge direction. Example of T. rex hunting edge habitat. Prey that were attacked at the forest’s edge may have reacted differently than prey that were attacked inside the forest. They still would have been vulnerable if they had made any drastic turns inside T. rex’s attack zone. If the prey animal had evolved to live in forest environments, then it probably would have made a 180° turn to run away in the opposite direction, down the edge of the forest. If the forest prey animal had managed to escape, it would have eventually slowed down and turned into the safety of the forest. T. rex would have initially had to make a slight turn when ambushing a prey animal like this, but T. rex would still have had a decent chance of success because the prey animal would have had to turn more than T. rex. If the prey animal had evolved to live in open environments, then it probably would have made a sideways turn out into open country. Even though the prey animal would not have needed to make a drastic about-face, it still needed to make some degree of a defensive turn out into open country. T. rex would still have had a chance for success because it would have ambushed the prey in a straight line attack. The more turning a prey animal had to make and the less turning T. rex had to make would equal a higher success rate for the attacking T. rex. Example of T. rex’s line of attack on prey animals that had evolved to live in forests. Example of T. rex’s line of attack on prey animals that had evolved to live in open environments. My parents inadvertently gave me an idea to apply to the Treeosaur theory. One winter morning many years ago, my parents were enjoying breakfast at their kitchen table. It was opening day of the deer firearms season. My parents live in a development on top of a small mountain. Halfway through breakfast, my parents felt strange vibrations. They looked out the window and witnessed a large herd of approximately 30 deer stampeding through their backyard. Hunting pressure from below had spooked the deer up hill and through developed neighborhoods. Like most homes today, my parents’ house is made mostly of wood. On that particular morning, my parents were sitting on wooden chairs at a wooden table in their kitchen with hardwood floors. The stampede vibrations pulsated through the ground and into the house’s wood frame, hardwood floors, wooden table and up into the wooden chairs my parents were sitting on. The distance from the kitchen to the herd of deer was about 20 yards. During my many hunting trips and countless hours I have spent stand hunting from a tree, I have never felt vibrations from running deer. I simply have never experienced a large herd of deer stampeding past my stand. T. rex stand hunting from a tree would have been leaning into and hugging a very large piece of wood (a tree) that was rooted deep into the ground. Was it possible that T. rex could have detected vibrations of walking or running prey through the tree it was holding? After all, T. rex’s prey were very large, heavy dinosaurs. This thought intrigued me. I did not want to dismiss this idea, so purchased a basic acceleration vibration meter. My plan was to set up a tree vibration experiment to see if ground vibrations could be detected in a tree. Dinosaurs were huge, as were some of the trees in their environments. In order to make the experiment manageable, I needed to scale everything down in size. I found the perfect small tree on my sister’s property to use in my experiment. I set up an eight-foot ladder, three feet away from the tree’s base, and attached a pulley inside the top of the ladder’s A-frame. I bolted a fence latch to a square piece of particleboard and secured it underneath one side of the ladder. I then placed 100 lbs. of weight on top of the particleboard as extra support. I ran a rope up through the pulley and tied it to a canvas bag containing six bricks with a total weight of 30 lbs. I hoisted up the bag on the pulley and attached the other end of the rope to a climbing clip, which snapped into the fence latch. Attached to the fence latch release switch was another piece of rope, which ran through a metal loop that was screwed into the particleboard. I was able to stand anywhere around the tree, pull the rope, and drop the 30 lb. bag onto the ground. The bag hitting the ground would simulate a heavy animal taking a single walking or running step in the vicinity of the tree. In order to take accurate vibration readings, the vibration meter tip must make contact with a hard, rigid part of the tree. The bark on this particular tree was on the softer side, so I hammered steel nails into the tree. The nails would provide rigid points from which to take vibration readings with the vibration meter tip. I measured and marked four vertical columns up the tree with white string. Column A was the closest side of the tree to the impact point. Column C was the farthest side of the tree from the impact point. Columns B & D were situated exactly in between columns A & C on each side of the tree. The tree was now quartered into equally spaced columns. I measured and marked three horizontal rows around the tree with white string. Each row was equally separated by 16”. Row 1 was 16” off the ground, row 2 was 32” off the ground, and row 3 was 48” off the ground. There were now twelve cross sections on the tree. I hammered nails exactly ¾” deep into the tree at each cross section. The twelve nails were deep enough through the soft bark to make contact with the inner hardwood of the tree. I kept my fingers crossed that vibrations from the falling bag would pulsate through the ground, up into the tree and out through the nails. All I had to do was place the tip of the vibration meter on each nail, drop the bag, and hopefully capture vibration readings. If the experiment were successful, it would give me some knowledge of how ground vibrations pulsate up into a tree. Upper-left photo: My tree vibration experiment. Upper-right photo: A close-up of the string cross sections and steel nails. 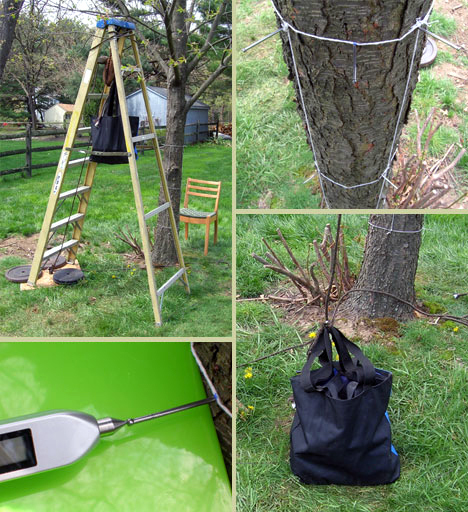 Bottom-left photo: A close up of the vibration meter taking a reading from a nail hammered into the tree. Bottom-right photo: The 30 lb. bag of bricks used to simulate a dinosaur footstep. With some help from my eager little assistants (my nieces & nephew), we pulled the rope and dropped the bag 36 times. The vibration meter did indeed detect the impact of the bag. I gathered a lot of vibration data from each of the twelve nails. I recorded three vibration readings from each nail and then calculated each cross section’s vibration acceleration average (m/s2). The way in which ground vibrations travel through a tree really blew me away; I was astounded by the results! The expense and effort of this experiment was worth every penny and every bead of sweat. To my complete surprise, the strongest vibration reading (.90 m/s2) came from nail 3C, which was on the opposite side of the tree and 48” off the ground. This was actually the farthest and highest nail from the impact point. Because of the strong vibration readings from nail 3C, I hammered in two additional nails (3BC & 3CD) 2 ¾” away from each side of nail 3C. I recorded three vibration readings from nail 3BC and three vibration readings from nail 3CD. Both nails (3BC & 3CD) essentially had the same vibration readings, so I combined all six readings and came up with a vibration acceleration average of (.77 m/s2). The strongest vibration readings on the tree were from nail 3C (.90 m/s2) and nails 3BC & 3CD (.77 m/s2). There seemed to be a vibration hot spot at this precise location on the tree. This vibration hot spot was at the level proportionate to where I believe T. rex’s jaw would have made contact with the tree. This leads me to believe that T. rex may have been able to detect prey vibrations if it had some sort of sensory area on the lower side of its jaw. If this were the case, then mature T. rexes probably stand hunted from large, thick trees and younger T. rexes probably stand hunted from smaller, thinner trees. The reason for this is because the vibration hot spot would be at different heights depending on the size of the tree. A T. rex would stand hunt from a tree that was proportionately close to its own body’s width in order to ensure that its jaw contacted the tree at the same level as the vibration hot spot. have made contact with the tree. Based on the knowledge gained from my experiment, I believe that T. rex would stand hunt from a tree and wait for prey vibrations to pulsate up the tree and into its jaw. Once T. rex’s jaw detected prey vibrations, it would do the Treeosaur sideways maneuver to the left or right. It would incrementally move around the tree to zero in on the strongest vibration in the tree. The area T. rex’s jaw would be seeking was the vibration hot spot. After its jaw found the vibration hot spot, T. rex would stop moving and settle into that position. This would automatically conceal T. rex’s body on the opposite side of the tree from approaching prey. This position also automatically pointed T. rex’s big gun (its jaws) in the direction of incoming prey. Example of T. rex performing the Treeosaur sideways maneuver to zero in on the vibration hot spot. If the incoming prey’s position shifted as it approached, the vibration hot spot would move a little to the left or right. T. rex had the option of adjusting its body position to follow the vibration hot spot around the tree, or remaining still and depend on the tree to break up its silhouette. T. rex would have made this judgment call depending on how far away the prey was from its location. Most of T. rex’s prey weighed many tons and probably would have produced significant ground vibrations. T. rex’s vibration senses may have been capable of detecting prey that was located even beyond its own auditory and visual senses. T. rex would have been able to move, rustle around a bit while repositioning itself, and settle into a proper attack position before the approaching prey’s own senses would have detected T. rex. I do not know the distance at which T. rex would have been able to detect incoming prey vibrations. It would have depended on the sensitivity of T. rex’s vibration senses and a few other factors. Perhaps T. rex was able to detect a herd of running prey from a greater distance over a single walking prey animal which was close in proximity. Different types of ground terrain and trees probably also effected how far away T. rex would have been able to detect prey with its vibration senses. If T. rex was not able to detect prey from a distance with its vibration senses, then this sense may have evolved to aid T. rex’s auditory and visual senses for close-range prey detection. T. rex’s vibration senses definitely would have been a strong asset for stand hunting from a tree in the dark. Like most animals, T. rex’s eyesight probably decreased greatly at night. T. rex’s vibration senses could have countered this problem by filling in the void to aid its hearing for night hunting. This would have made T. rex a lethal predator 24 hours a day. In addition to detecting and estimating the direction of incoming prey, T. rex may have been able to determine other important details about incoming prey with its vibration senses. Species of prey, size of prey, number of prey, and even certain health issues of prey may have had different ground vibrations. Perhaps T. rex was able to interpret this vibration information to its advantage. If T. rex had detected a single, injured, non-offensive hadrosaur, then T. rex would have stayed put and committed to the hunt. If T. rex had detected a large herd of healthy, potentially dangerous, Ceratopsids, then T. rex may have left the area and abandoned the hunt altogether. T. rex also may have been able to determine exactly how far away a prey animal was to its position. T. rex’s vibration senses may have been the key for its hunting success and overall survival. Some paleontologists believe T. rex was a lone hunter and some paleontologists believe T. rex was a pack hunter. I personally support both theories. Multiple T. rexes stand hunting from trees in one localized area would be like casting a larger net into a school of fish. Paleontologists have evidence that a majority of T. rex’s prey traveled in large herds. It only seems reasonable to believe that some T. rexes stand hunted from trees in small packs to ambush these large herds of prey. Imagine a pack of T. rexes strung along the edge of a forest waiting for a herd of prey. The ambushing T. rexes would surely have been able to bring down multiple prey during one single attack. Or imagine a pack of T. rexes clustered together deep inside a forest waiting for prey. Once prey was detected, all of the T. rexes would have oriented themselves in the general direction of approaching prey and waited to attack. Example of a pack of T. rexes hunting edge habitat. Example of a pack of T. rexes hunting inside a forest waiting for prey to approach from any direction. Example of a pack of T. rexes orienting themselves toward the direction of approaching prey. An argument could be made that the more T. rexes in one concentrated area, then the more scent prey animals would have had to detect. This could be true in some situations, but remember that wind usually blows in one single direction at a given time. A herd of prey walking upwind or crosswind could have approached approach a lone T. rex or a pack of a dozen T. rexes. The number of waiting predators simply would not have mattered. The herd of prey would not have been able to smell the lone T. rex or the pack of T. rexes until it was probably too late. This is why I believe a pack of T. rexes or a lone T. rex would have both survived by using the stand hunting from a tree strategy. A lone T. rex may have had a more difficult time acquiring food than a pack, but it probably could have survived on its own. In addition to stand hunting, I believe other aspects of T. rex life would have been dependent on the trees in its environment. T. rex’s body design seemed custom-made to hug a tree in the Treeosaur posture for long periods of time. It seems reasonable to consider that T. rex could have also slept and even mated in the Treeosaur posture. T. rex stand hunting from a tree would not have had to be on red alert 100% of the time. T. rex would have been able to doze off and sleep for long periods of time in the Treeosaur posture. While catching some Zs, T. rex would have depended on its hearing and possible vibration senses to alert itself of approaching prey. Once fully awake and alert, T. rex would have focused its senses in the direction of the approaching prey and positioned itself for an attack. Simultaneously sleeping and hunting from a tree would have been a very energy efficient way of life for T. rex. I hate to admit it, but occasionally I will doze off while stand hunting from a tree. This is actually more common among hunters than one might think. Deer are usually most active in the first few hours following daybreak and the last few hours before nightfall. I have no guilt dozing off a bit during the midday lull, especially if I’m comfortably leaning back against the base of a tree. If deer happen to be active during midday, the sound of approaching deer will usually wake me up. All I need to do is open my eyes and I’m hunting again. Now imagine a receptive female T. rex in a forest in search of a mate. Once she had lured in an acceptable male, all she would have had to do was hug a nearby tree. Then the male T. rex would have hugged and mounted the female in the Treeosaur posture. The upper back of the female T. rex was very much the same shape as a tree trunk, so the male would have had no problem embracing the female with its tiny arms. With the aid of a tree, the Treeosaur posture would have stabilized the pair and made the mating process more manageable for these massive dinosaurs. Earlier in this section, I stated that the stand hunting from a tree strategy does not exist in the modern animal world. I do not know of any large, modern animal that sits at the base of a tree, blends in with its surroundings, and waits to ambush large prey. I am not a biologist, so I could be wrong with this statement. In fact, I hope I am wrong. I hope there is some large, modern animal somewhere in the world that uses the stand hunting from a tree strategy; this would further support the Treeosaur theory. There are plenty of small, modern animals (snakes, lizards, etc.) that hunt among the trees, though not in the same exact way as the Treeosaur theory. There is one small creature I know of which does use trees in a similar way to the Treeosaur theory, though more as a defensive measure. This 7 – 9 lb. relative of the dinosaurs lives in the North American forests. During the spring, this animal is known to sit at the base of a tree, blend in, and aggressively attack any animal that gets too close. This creature will attack small forest animals and it will also go after larger animals, such as deer and bears. I had even heard rumors of humans being attacked by this animal. I never witnessed this myself until one spring morning many years ago. I remember that morning vividly. It was opening day of spring turkey season in Pennsylvania. Not only am I a dedicated deer hunter, but I’m also an avid turkey hunter. I hiked into my favorite forest early before sunrise. I spent the first two hours of daylight sitting at the base of a tree trying to call in male turkeys with a man-made, wooden box turkey call. Stand hunting from a tree goes with turkey hunting like bread & butter. Turkeys have incredible eyesight; trying to sneak up close to them is next to impossible. A turkey hunter’s best bet for locating male turkeys is to walk through an area and call to them with a female (hen) turkey call or other man-made locator calls. Nearby male turkeys will usually respond by calling back, revealing their approximate position. The turkey hunter, wearing camouflage clothing from head to toe, will then settle in at the base of a tree, blend in, and attempt to call in male turkeys into his weapon’s striking range. This is, by far, the best hunting strategy to use on male turkeys in the spring. After two hours of calling male turkeys proved unsuccessful, I packed up my gear and headed farther into the forest. I stopped every few hundred yards to call and listen for responding male turkeys. No luck. I moved deeper and deeper into the forest. As I walked past a large oak tree, a small piece of its base exploded off the tree and came to life to attack me. I was taken completely by surprise! It really scared the hell out of me at first, but I then burst out laughing as the little animal started to mock attack my shins. To keep the animal at bay, I held out my shotgun horizontally and low to the ground with both hands. I started backing away from the tree and out of the immediate area. I reached for a disposable camera that I had tucked in my shirt pocket. I managed to take a photo of the animal as it aggressively circled around me. The distance between us widened as I moved farther and farther away from the large oak tree. The animal circled around me a few more times and then flew up into a tree. disturbed her as she sat or her nest at the base of an oak tree. This aggressive little creature was a female hen turkey. I was now about 100 yards from her nest, which was at the base of that large oak tree. The protective mother remained perched up in the tree to make sure I continued walking away from her nest. The thought of shooting her never crossed my mind. Killing a nesting hen turkey in the spring is unethical, as well as illegal in most states. The only time a hunter can legally shoot a hen turkey is in the fall when they are not nesting. Hen turkeys living in a forest will sometimes build their nest against a large rock; however, the most common place is at the base of a tree. Why would this hen build her nest at the base of the large oak tree? The answer should be obvious by now: to blend into her environment. By positioning her nest and body against the tree, one side of the hen is fully protected while she keeps and eye out for predators. The hen’s brown and black feather pattern is natural camouflage against most forest trees. If this particular hen had stayed on her nest, I would have walked right by and never even detected her presence. She perceived me as a threat to her nest so she burst into a very aggressive defense mode. The hen used the tree defensively, not offensively like the Treeosaur theory. Still, the basic principal is the same. Theoretically, if the hen was a larger predator, I would have been totally ambushed! Example of a hen turkey nesting at the base of a tree. Once again, I have to mention that 1993 dinosaur movie. It shows a pivotal scene where the main character discovers hatched dinosaur eggs at the base of a tree. I think this is a very believable scenario. Some modern birds, like turkeys, lay eggs at the bases of trees. It only makes sense that some dinosaurs may have done the same. I can totally imagine a female T. rex stand hunting from a tree in the Treeosaur posture while guarding her nest on the opposite side of the tree. The female T. rex would have been able to simultaneously hunt, sleep, and protect her nest from one single position. What is the one thing that a T. rex, a human, and a turkey have in common? All three animals are bipedal and walk on two legs. This might not seem important, but it is actually an essential body design for an animal attempting to stand hunt from a tree. Being bipedal allows T. rex and human hunters to effectively blend their bodies against a tree in a more vertical, upright posture. This vertical, upright posture allows T. rex and human hunters to keep their heads and eyes as high as possible in a forest. Forests usually have some sort of low vegetation. Seeing over this vegetation while remaining invisible to approaching prey is a huge advantage for T. rex and human hunters. A quadrupedal forest predator that walks on four legs, like a timber wolf or mountain lion, does not have this same visual height advantage and would not be able to see well over the low vegetation. Also, if a timber wolf or mountain lion did attempt to stand hunt from a tree, their horizontal silhouettes would not blend well against a tree. Unlike quadrupedal forest predators, bipedal forest predators clearly have the best body design for stand hunting from a tree. Example showing the benefits that a bipedal T. rex and a bipedal human have over a quadrupedal wolf if attempting to stand hunt from a tree. I believe that the Treeosaur theory can help shed some light on the T. rex tiny arm mystery, as well as the “predator or scavenger” debate. I propose that T. rex’s tiny arms had multiple functions essential to the Treeosaur posture: to help T. rex attach itself to a tree, to help T. rex stabilize itself against a tree for extended periods of time, and to help T. rex perform the Treeosaur sideways maneuver around a tree. T. rex would have had larger and stronger arms if those were the only body parts dedicated for these tree tasks. However, its jaws, neck, back, pubis, legs, and tail were all vital parts that worked in unison to aid T. rex in every aspect of the Treeosaur posture. T. rex’s arms were small simply because they were at the appropriate concealable size they needed to be to aid the rest of T. rex’s body perform efficiently while in the Treeosaur posture. Larger arms would have been overkill and more detectable from prey on the opposite side of the tree. T. rex starting an attack from the Treeosaur posture. A close-up of T. rex’s arms and knees in the Treeosaur posture. I agree with paleontologists who believe that T. rex’s arms were used for mating; however, I believe that this act was performed with the female in the Treeosaur posture against a tree. I agree with paleontologists who believe that T. rex’s arms helped stabilize the dinosaur as it rose up from a sitting position; however, I believe that this act was performed from the Treeosaur posture against a tree, not from the ground up. I believe that every aspect of T. rex’s body design had evolved to efficiently attach and blend itself to a tree in the Treeosaur posture. T. rex did not sit around waiting for prey to die of natural causes. Nor did T. rex settle for feeding off of carcasses brought down by other predators. T. rex did its own dirty work by stealthily stand hunting from a tree and attacking prey animals that wandered into its attack zone. I believe a major reason for T. rex’s predatory success was because it specialized in this very effective hunting strategy. In my quest to learn about T. rex, I found out that there were many other theropod dinosaurs that existed aside from T. rex. Some of these theropods are close relatives of T. rex: Albertosaurus, Nanotyrannus, Alioramus, Appalachiosaurus, Tarbosaurus, Daspletosaurus, Gorgosaurus, etc. These cousins of T. rex varied in a few different sizes, but proportionately, all had similar body designs as T. rex. Because of their shared body design, I believe that these other Tyrannosaurs also used the stand hunting from a tree strategy.